There are plenty of places to explore along the Costa Brava. Heading north, you will shortly arrive at Port de la Selva and then on to France, which is separated from Catalunya or Catalonia by the Pyrenees. Heading south, there is a huge choice of long beaches, rocky coves and fishing villages to choose from. We would recommend that you split your holiday up- spend some time soaking up the atmosphere in Cadaqués and then do a bit of exploring, taking in towns like Palamós, with its cute old town, or head for lunch in one of the small beach side restaurants at Tamaríu, Calella or Llafranc. There´s plenty to do and explore inland as well, such as the Dali museum at Figueres, a medeival town, or ambling through the old town in Girona, which is the provincial capital. If you want to know where one of the best walks on the Costa Brava is, read on: it's a reasonably difficult walk (you'll need decent walking shoes) that winds along the coast from Llafranc to Tamariu). 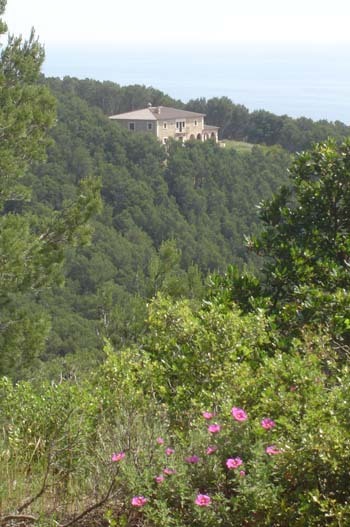 Halfway to Tamariu you will pass a magnificent Masia or country pile set in its own peninsular (see photo above). Jealous? It takes about 1.5 to 2 hours to get to Tamariu depending on your fitness level. When you arrive, kick off your shoes and dive into the Med, and then head for lunch under the pines at The Hotel Tamariu on the corner. They'll arrange a taxi for you to get back to Llafranc!